My 7month old has been sleeping all day. I am kinda worried. She is a teething but she has never done this. Any advice? @Abby – Thank you for reading and for sharing with us. We understand your worry! We’re not entirely sure what you mean by all day, but if she’s sleeping way more than usual and it’s worrying you, you should reach out to her healthcare provider for more specific support. Many times babies will sleep more when they aren’t feeling well or going through some growth, but if she’s behaving too far out of the norm and it’s causing you any concern, her physician should be your first stop. Good luck, and hang in there, Abby! Hi! My son is turning 2 years old in 1.5 week & past several days he’s been napping 2-3 hours. He’s has no fever but whole hand in mouth at times; I know he may be having a growth spurt and a tooth definitely coming out but my question is what about keeping routine? His bedtime was 9:30pm asleep by 10; since his naps have gotten longer he goes to bed later and it’s exhausting! Is it bad to gently wake them up during their nap; maybe 1.5/2hrs into it? He usually wakes up 9am/9:30pm – now wakes up past 10; would it be okay to wake him up earlier in the morning to get his nap earlier and go to bed a little earlier? I would like to get his schedule to be earlier since the winter season is here and sun down is earlier to have some outside time. Just would appreciate some feedback from experienced moms & what you recommend during this age/growth period? Thank you! My son is just over two and usually naps for 1.5hrs at lunchtime and then 10-11 hrs at night. He had a fever in the week (now gone) and has a cough but for the last four days has been napping 2.5hrs at lunchtime and is hardly eating. He’s also a bit spotty on his face (nowhere else on his body). Should I be worried or he is just getting over his illness or having a growth spurt? Hi @Jenna Shea, I am not in the medical field, but I would assume he’s just recovering from his illness. My son also often reacts very badly with a rash after a fever, it’s so odd. I did take him to my pediatrician just to make sure it wasn’t anything else, so you may decide to do the same for clarity and peace of mind. Since I’m not a medical professional I can’t say for sure, so definitely give them a call and hopefully his appetite comes back soon and things get back to normal. Hi! I have a 2 month old and today she really has not been eating much. She has only been sleeping. Is this a growth spurt or something else because she doesn’t have a fever or seem sick? Hi @Tracy, thanks for writing to us! As the article mentions, it is certainly possible it could be a growth spurt, but you will still want to make sure your baby is getting all the nutrition she needs. If you have any concerns, it may be wise to give your child’s doctor a call. Hopefully it is nothing, but just for a peace of mind! She will likely “wake up” in a few days, my son was extremely sleepy at that age too. I hope this helps! This is a good article but I think mire emphasis needs to be put on checking for a medic as L reason first. Excessive sleeping and tiring easily can be a sign of heart function issues, and congenital heart defects affect 1 in 100 babies born. Often heart defect can be missed in ultrasounds and at birth checks but be caught later once the heart problems start having symptoms. Hi @Caitlin Billings, thanks so much for reading and for writing in! We definitely agree that seeking medical help is very important if there is any concern as well, even if it’s just for peace of mind it’s important go receive confirmation from a medical professional. Thanks again for writing. My little girl is 15 months and is usually full of energy. After coming home from daycare she will usually play in the playroom for a good hour getting all her extra energy out until it’s bedtime. The past two days I’ve gotten her home and she falls asleep the second I hold her. Tonight I tried sitting her up to feed her and she fell asleep sitting up. This isn’t my normal baby. No fever, no diarrhea, no sign of illness.. basically nothing I can logically take her to the doctor for but I know it’s not normal. Thank you for using The Baby Sleep Site as a resource! I’m sorry to hear your baby has been sleeping more than normal. Have you checked in with the daycare? Perhaps her naps have been interrupted or the schedule has been changed? Sometimes a growth spurt can also cause sleepiness for a couple of days. If it lasts longer than that and it doesn’t sound like anything has changed at daycare, it would probably be worth calling your pediatrician and speaking to someone, if only for your own peace of mind. Good luck! Hi! My 2 year old son just recovered from 4 days of fever with cough.. the day after, no fever but still with cough(normal cough) and he just slept a total of 16 hrs but with intervals (5hrs at night 7:30pm to 12:30pm, 2 hrs awake, 8.5hrs sleep again 2:30am-11am, 2.5 hrs sleep 3:30pm-6:00pm).. is this normal or something is wrong? Thank you for using The Baby Sleep Site as a resource! I’m sorry to hear your son was sick, and hope he’ll be recovered very soon. Many kiddos do sleep a lot more than usual the day or two after they get over an illness, but it shouldn’t last too long. If you have any concerns at all about his behavior, please do check in with your pediatrician, as it’s always possible that the illness has become more complicated, or generated a lingering issue like an ear infection. Good luck! My 3 month old went to sleep last night around 11. She woke at 5 only long enough to drink her milk. She woke again at 8 and 2 but again only long enough to drink. Should I be concerned? @Stephanie – Thank you for reading and for sharing with us. 15-16 hours of sleep per day for a 3-month old is still considered normal – if your little girl is consistently sleeping longer than that by stretches and not staying awake long enough to show alertness and move and develop, you should call her healthcare provider to discuss this for possible reasons or for reassurance. If this has only happened one time, it could be just that she was super tired that day! Good luck, and hang in there! My 6mon. old has pooped three times today but very little poop. She tugs at her left ear only when she eats, and often times tilts her head to the left (chin facing opposite shoulder). She will pull on her hair too & she’s been taking longer than usual naps & I ran her temp with an ear thermometer reading at 96.6 F. I’m worried something may be wrong but hopefully it’s nothing major. How do I know when to take her into the ER or wait for a doctors visit? Yes she’s been eating baby food but since a month+ now along with her formula. The tugging of the ear isn’t new but recent as in 1month now. Hair pulling & tilting of the head isn’t new either but all these signs worry me. She didn’t have any issues when born & certainly was a healthy baby. No teeth yet & by the feel of my finger no signs of teeth coming in. Hi @Lisa, thank you for writing to us. I’m sorry you are worried about your baby! I do remember that baby’s poop changes at some point, I can’t remember that exact age but I do remember going through a bit of a poop struggle with my son as his tummy adjusted to foods so I asked my pediatrician for suggestions on keeping him more regular and they have lots of tips and tricks for me. It’s great she doesn’t have a fever, but if you are concerned perhaps you can just give your doctor’s office a call and talk to the nurse that’s on staff right now. I am not a medical professional so I don’t want to offer incorrect medical advise. I hope that helps ease your mind a bit and hopefully she’s more herself today. 🙂 Remember that babies change so much so just when you think you have it figured out, they change on you again. It’s a wild ride being a momma, for sure! @Genesis – Thanks for writing to us. I am sorry to hear your daughter has suddenly seemed a bit off. My son went through something similar around that age, turned out for us he was cutting like 6 teeth at once. But if it’s not teeth, it is likely it is just her experiencing a developmental change (there is a sleep regression that happens around 12 months for some babies that could be affecting her: https://www.babysleepsite.com/baby-naps-2/12-month-olds-one-nap-transition/) but of course if you have any concern that she may be not feeling herself, I’d be sure to bring that up to her doctor to make sure all is well. I hope things improve for you soon! Hang in there! My 3.5 month old sleeps pretty well at night. Bedtime between 6-8 with a goal of 7pm. He has been doing a 7-8 hour stretch and then a fed anywhere from 2-4:30am. He is rocked back to sleep and wakes up 6:30-7:30 am. My issue is daytime. He continues to have an extremely shortbawake window that maxes out at around an hour. He is a hot mess if we stretch to 1.5 hours. He is a chronic catnapper of 45 mins. I am in a vicious cycle of constantly putting him down for naps. Is it normal to have such a sleepy baby during the day with decent sleep at night? He usually wakes up happy and then progressively beck es sleepy as 60 minutes approaches – yawning, eye rubbing. Hi Kristy – Thank you for visiting! It is great to hear that your baby is sleeping so well at night! Yay! Short naps are still SO common at this age, and if he also has a short “awake window” that is fine too! It sounds like you have found a schedule that works for you, which may be tough since you’re putting him down do often, will not last forever! He will stretch that awake window when he is ready, and you can continue to experiment with stretching the time little by little, as you are able. Keep it up, and his naps will consolidate, and his awake window will widen! Hang in there until then and thanks again for writing! It’s strange my 2 year old usually sleeps from 7-7ish. Some times she would wake up early sometimes a bit later. But for the last couple of weeks she’s been sleeping in so long! Sometimes as late as 9 am. I can hear her fuss and then she goes back to sleep. She still naps usually about 2 hours. Some days she skips her nap and just hangs out in her crib. I thought at first a growth spurt but she’s not really eating all that much. She’s due for her top molars but would this sleep stage last that long if it was teething? She’s isn’t sick and she is her normal self during the day. This regression is usually pretty short, though sometimes we will need to adjust a daytime schedule to prevent night-waking, especially if she’s awake at night and then sleeping in in the morning and refusing nap. I hope this helps! My almost 3 year old daughter sleeps a lot. She takes a nap between 1-3 hours every day and is in bed by 9 PM. Should I be concerned? Thanks for using The Baby Sleep Site as a resource! Most 3 year-olds are sleeping 12-14 hours in a 24 hour day. If your daughter’s still napping, we’d usually expect a 1-2 hour nap plus a 10-11 hour night, so from your description, it sounds like she’s right on track. If you have any concerns at all about her growth, or she seems excessively tired even after sleeping, it’s always good to check in with her pediatrician to rule out any medical concerns. I hope this helps! Hey. My 30 days old baby doesnt drinking milk properly .he is alwys sleeping. And he alwys have some gas in stomach. His burping is greater than as usual. When we try to wake up, He doesnt.even he wake up, he only drink for 20 or 30 sec. what we do?? @Reshu – Thank you for stopping by and for reading. We’re sorry to hear that your little guy’s eating and sleeping has caused you all such worry! 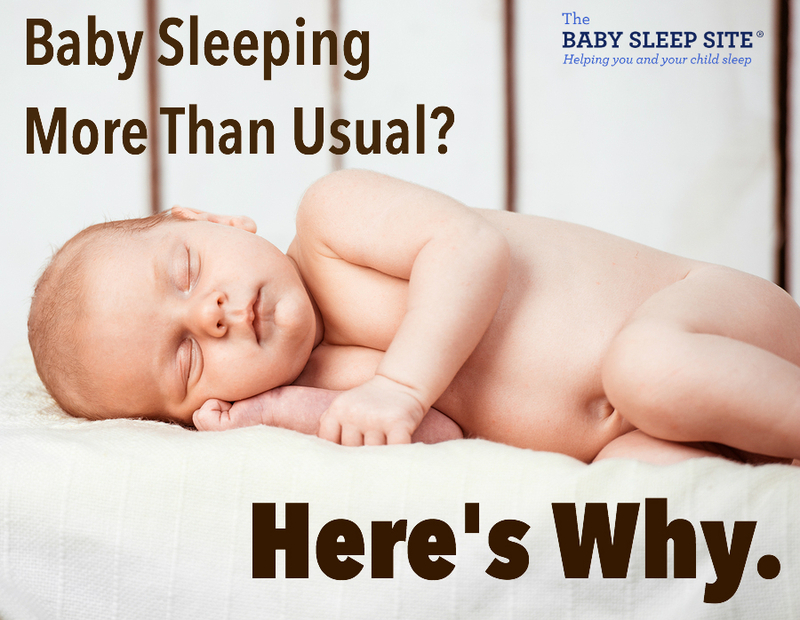 Newborn babies do sleep the bulk of the day away waking mostly just to feed and get cleaned up. You don’t say how much your little guy is sleeping or feeding, but we’d encourage you to please reach out to his healthcare provider who would be better able to help you determine what’s going on with your baby boy. Hang in there, Reshu! My 2 1/2 year old granddaughter shows no illness symptoms. No fever, no runny nose. However, she is cranky, acting out, crying and wants to go to sleep. This is totally not her normal behavior. She is eating a little less but drinking normal. What could this be? @Jan – Thank you for reading and for sharing with us. I’m so sorry to hear that your little granddaughter is behaving oddly! I know how worrying that has to be for you all. We’d suggest that even though she’s showing no physical signs of illness, that you still ring up her medical provider to let them know what’s going on and get their advice. Low appetite and sleepiness is often a sign that something may be going on so getting some medical input is definitely a good idea. Hang in there, Jan and best of wishes to you all!